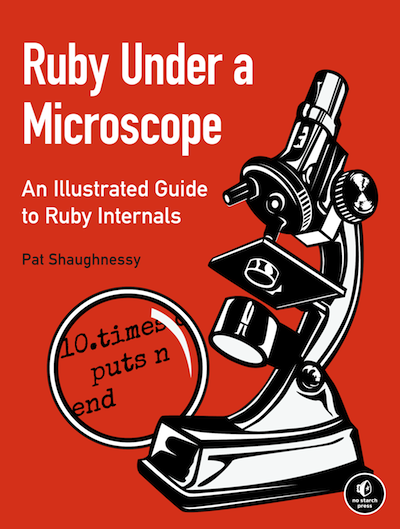 Ruby Under a Microscope is a great primer into understanding the underlying mechanics of the Ruby language. It demystifies the “magic” surrounding seemingly simple things, for example parsing a string, and I’m a big fan of demystification. This book for me hits the sweet spot between technical aptitude and plain language for both advanced and intermediate levels of study. Starting out as a novice programmer it is usual to hear that Ruby is an interpreted language. As an interpreted language1, it does not require a compilation step before or at runtime to turn the high-level expressions you’ve written in the text editor into machine-readable bytecode. However, lurking below this simple explanation is the Matz’s Ruby Interpreter2 (MRI, also called CRuby for reasons that will be quickly apparent,) a series of interpreters which do the heavy lifting when it comes to reducing and interpreting code. It accomplishes this using C and YARV (Yet Another Ruby Virtual Machine3). This applies to Ruby 1.9 and onwards when YARV was merged into Ruby core; before this Ruby was much slower due to the fact that implementation, still in C, was designed as a single-pass interpreted language. In this capacity, C is acting as an intermediate language4, as it takes the source code of a Ruby program and translates it into a form more suitable for generating object or machine code. In the book, author Pat Shaughnessy takes us through the life cycle of a simple Ruby “Hello World” program. In excruciating detail we are shown how MRI takes apart each character in a Ruby program and determines the syntax rules to apply. We are also shown the control flow of MRI as the pointer moves through the stack. I found this really fascinating and useful to know. All in all, the book is a very valuable and eye-opening account on the innards of Ruby. There are chapters on JRuby, and metaprogramming. In future editions it will be interesting to see if new developments will be covered. I hope so. In any programming language one will find the same fundamental building blocks of computer science. This book inspired me to dig deeper and was one of the main reasons I decided to learn more fundamental computer science topics and even learn C itself! I recommend starting with any of the freely available online university introductory computer science courses, particularly Stanford’s5 or Harvard’s6.